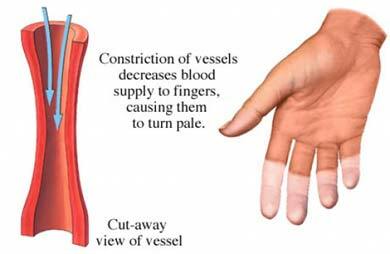 Raynaud disease and phenomenon are problems with the blood vessels. It causes blood flow problems to the fingers ears, nose, and lips. Raynaud disease (primary Raynaud) is the most common form. There are no other associated medical conditions. Blood vessels normally narrow in response to cold temperatures or emotional stress. Raynaud is an exaggerated response to these triggers. The narrow blood vessels make it difficult to get enough blood flow to certain areas of the body. Fingers are affected most often. It is not known what causes this abnormal reaction, but it is probably related to a problem of the nervous system. Secondary Raynaud is believed to be caused by the associated disease. Throbbing and tingling sensations, stinging, pain, and swelling of the affected area. This may occur at the end of the attack as blood flow returns to the area. Run warm (not hot) water over fingers and toes as quickly as possible. However, do not place anything hot on your skin, as it may cause damage. If you are outside, move inside. Place your hands on a warm area of the body, such as under your armpits or on the abdomen. Try to stimulate blood circulation by wiggling your fingers and toes. Make wide circles with your arms. Rarely, surgery may be done when symptoms are persistent and debilitating. This involves cutting the sympathetic nerves that supply the affected fingers. These nerves control the expansion and narrowing of blood vessels. Chemicals may be injected into the nerve that is responsible for the narrowed blood vessel. The chemical stops the nerve. Treating the underlying disorder will help manage the symptoms of Secondary Raynaud. Stay warm. Avoid cold temperatures when possible. Wear clothing that covers extremities such as hats, gloves, or socks. Learn to adapt to stressful situations. If you smoke, talk to your doctor about how to successfully quit . Consider using biofeedback training to control body temperature. Avoid the use of medications known to worsen Raynaud. Keep skin on fingers and toes protected. Goundry B, et al. Diagnosis and management of Raynaud’s phenomenon. BMJ. 2012;344:e289. Herrick AL. Evidence-based management of Raynaud’s phenomenon. Ther Adv Musculoskeletal Dis. 2017;9(12):317-329. Raynaud phenomenon. EBSCO DynaMed Plus website. Available at: http://www.dynamed.com/topics/dmp~AN~T115788/Raynaud-phenomenon . Updated August 16, 2016. Accessed February 14, 2018. Raynauds phenomenon. Cedars Sinai website. Available at: http://www.cedars-sinai.edu/Patients/Health-Conditions/Raynauds-Phenomenon.aspx. Accessed February 14, 2018. Raynaud's phenomenom. National Institute of Arthritis and Musculoskeletal and Skin Diseases website. Available at: http://www.niams.nih.gov/Health%5FInfo/Raynauds%5FPhenomenon/raynauds%5Fphenomenon%5Fff.pdf. Accessed February 14, 2018.